Summary for the Busy Executive: Ooooo! Popcorn… with buttah. It used to be that otherwise sensible people looked down on movie music as a genre, just as high-minded, Transcendentally-oriented music lovers in the 19th century looked down on the composers of bel canto opera, whose heirs movie composers are, to some extent. Thank Louis B. Mayer, those days are long gone. Now sensible people, before they make up their minds on quality, look at individual movie scores. It happens that a large number of otherwise respectable composers churned out quite a few of them: Honegger, Milhaud, Ibert, Vaughan Williams, Walton, Thomson, Prokofieff, Shostakovich, Copland, and Antheil, as well as the usual suspects like Korngold, Waxman, Rózsa, Herrmann, and Webb. Film music, like opera, is rarely symphonic music. The skills required aren't quite the same, but it's a mistake to regard them as lesser. Verdi may not have been able to compose a symphony, but Brahms couldn't write an opera to save his life (and he tried). Walton's trilogy of scores for Olivier's Shakespeare films – Hamlet, Henry V, and Richard III – immediately entered the company of such classics as Honegger's L'Idee, Prokofieff's Alexander Nevsky, and Copland's Red Pony. They remain for film composers something to shoot for. As far as I know, Walton never arranged his scores for concert performance but recorded the reworkings of Muir Mathieson, the Holy Ghost of British film music. It's a particularly rich score, including a terrific sequence on the Battle of Agincourt that turns Prokofieff's "Battle on the Ice" in Nevsky from Russian to British epic. The two excerpts here come from the quieter scenes. "The Death of Falstaff" is a two-and-a-half minute passacaglia that simultaneously portrays the body of the knight sinking into the grave as his soul rises to heaven. "Touch her soft lips and part" accompanies Henry's wooing of the French princess, tenderly and sweetly. People know Ennio Morricone best for his work with Sergio Leone. Indeed, his work for that director, like the films themselves, raise kitsch to the level of art through sheer audacity. Once you hear these scores, they lodge in your brain, whether you want them there or not. I admit I don't care for Morricone's music, but I have to admit that he can give you something readily-identifiable, like a poem by Edgar Allen Poe. The score for The Mission, a forgettable film with some very good actors in it (including de Niro), doesn't have the campy energy of Morricone's Leone work. It reminded me of Auden's remark on Poe: "If he were a better poet, he would be less interesting." Here Morricone is guilty of Good Taste. Nothing's wrong with the excerpts, but that doesn't mean you want to keep them. I hesitate to call Herrmann's score to Psycho his masterpiece, because he wrote so many of them. Certainly, however, it counts as one of his most readily-identifiable, lifting a macabre, pungent campfire tale to something truly creepy. In fact, I'm convinced that most of that movie's punch comes from the music, rather than from the wooden acting (Vera Miles, John Gavin, Janet Leigh) or even, excepting the shower murder, Hitchcock's assemblage (he used quickie techniques he developed for his television program, and it shows). Herrmann's score functioned far differently than most of the movie music of its time, sounding almost symphonically integrated. Perhaps the reason for this lay in its origin, not in the movie itself, but in Herrmann's Sinfonietta from 1934, one of his most aggressively modernist concert works. The score bristles with so many memorable passages, gestures, and moods, it becomes practically another character, probably the strongest. The demonic shrieks as the murderer's knife falls, the ominous deep groan in the bass, the worrisome scurrying – a score of many colors, brought off with only an ensemble of strings – have sunk deeper into the popular consciousness than the actual movie. To some extent a Herrmann protégé, Elmer Bernstein, a pupil of the avant-garde Stefan Wolpe and no relation to Leonard, also helped break the hold of Tchaikovskian pasticheurs on American film music. 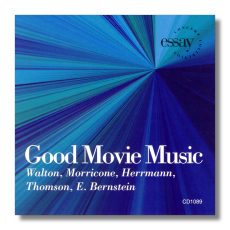 Like most successful film composers, Bernstein is an all-rounder when it comes to musical styles, but I find him at his best usually in a jazz or Copland-pastoral vein. To Kill a Mockingbird for me is one of his finest scores. There was once an LP conducted by the composer of the complete soundtrack, but that, of course, is long gone. In the meantime, you'll have to make do with excerpts. To me, the music is the perfect aural evocation of Harper Lee's book. One can argue for Virgil Thomson's movie music as the most radical in concept, among the scores here. Thomson is one of the few American Modernists who wasn't really a Romantic in disguise. Of all the "first-generation" American moderns, he remained far closer to the "objectivity" of Twenties Paris – Satie and the Stravinsky of the Octet filtered through a no-nonsense Midwestern sensibility. His movie music doesn't underline mood or manipulate emotion as much as it describes physical setting and movement. In the late Eighties, with the composer's help and participation, Kapp recorded and later released a landmark CD (ESSAY CD1005) of Thomson's The Plow That Broke the Plains and The River in their original film incarnations, as opposed to the composer's concert re-orchestrations. Something similar was planned for Louisiana Story. But Thomson had died in 1989, and the guardians of his papers wouldn't release the material. So we get the two concert suites Thomson salvaged from the score: Louisiana Story which contains original material, and Acadian Songs and Dances which sets traditional tunes. For the longest time you could get the first, but not the second. Both show Thomson pretty much at or near his best. Thomson's music often deceives: it's so full of dominant-tonic harmonies (like "Old McDonald") that people think it simple-minded. Even composer Ned Rorem, who worked for Thomson as a copyist, had trouble with it. I admit myself that certain works of Thomson go on too long for me with that sort of thing. But it usually turns out that dominant-tonic is seldom just that. Thomson works minimal but brilliant variations on the trope. In the "Squeeze Box" movement of Acadian Songs and Dances, for example, the harmony doesn't quite mesh with the rhythm or the melody, evoking amateurs who lose their place. When Thomson leaves these harmonies, his new ones are breathtakingly original, even startling or as far-out as you like. Thomson is an almost mathematically-elegant composer, a magician who lets you see everything he's up to. Paradoxically, the result is more, rather than less enchanting. I love both suites, with maybe an edge going to Thomson's original movements. The opening "Pastoral" gives you the surreal beauty and loneliness of the bayou. The last two movements, the most elaborate, depict "Robbing the Alligator's Nest" and "Boy fights alligator." They are also a free passacaglia and a fugue, respectively. But it's not merely a stunt: the music has dramatic point. The passacaglia calls up the stealth of the boy. The wild-and-wooly fugue eschews any hint of the classroom or even Bach. It reminds me a little of, believe it or not, César Franck, or at least his followers, although none of them turned out any fugue as flailing and slashing as this one. Another winner – a delight, even – from Kapp and the Philharmonia Virtuosi. My only quibble is the Walton: I want more excerpts, but they would likely have required a much larger ensemble. Kapp whets the appetite for more. I'd seek out Walton's own recordings of the Shakespeare trilogy, a classic of the stereo era, released on EMI. At any rate, Kapp's performances are live, but there's very little a studio session could have improved. The playing is electric. Nothing just lays there, not even the Morricone. The musicians sound really into these works and alert to one another – chamber music on a big scale, with a sense of people doing something very well indeed that they enjoy. Barring the rare audience cough, the recorded sound is fine and concert-hall natural.